The Ergo has a number of peculiar features, but I like the grip best, so let’s start there. 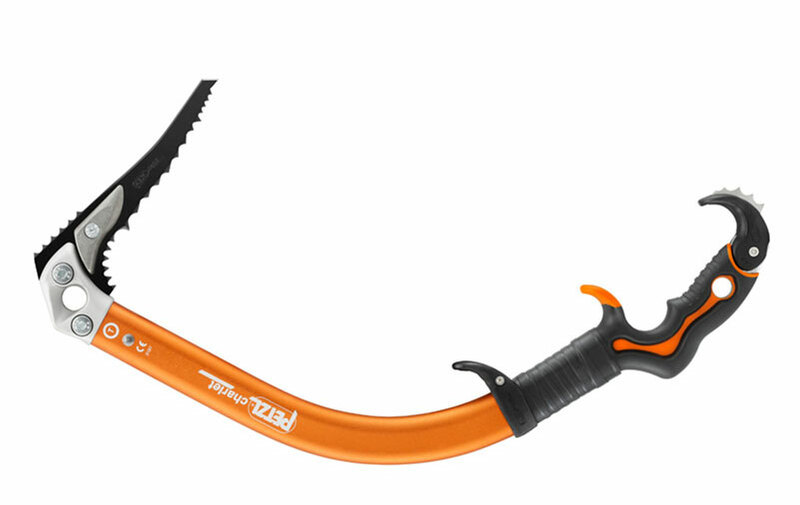 The Petzl Ergo looks as if it has been left on a hot dash for too long—the shaft is bent so crazily the grip is nearly parallel to the pick. I had heard from critics that the Ergo’s shape took as much acclimatization as an 8,000-meter peak. You go up a little bit, adjust your swing, come down, think about it and go back up. Bobblecock! It could just the peculiar mechanics of my body, but I didn’t find anything unnatural about the Ergo at all. Its swing suited my swing. Its grip suited my grip, etc. It was in fact one of the best—maybe the best—dry tools I have used and, pleasant surprise, it was also a precise weapon on ice. The Ergo has a number of peculiar features, but I like the grip best, so let’s start there. The bottom pommel adjusts with an allen wrench, letting you move the pinky rest to fit your hand and glove. This sounds minor, but with the Ergo, which has a highly contoured “ergo” grip, getting your hand to fit the contours is essential for being able to hold the tool with minimal effort. Get this dialed in and your trigger finger nestles into a notch that helps you aim you swing and helps keep your hand from slipping off the tool. Comfortwise, the primary grip is as good as any out there. The base of the pommel has a row of steel serrations that, when the pommel is against the ice or rock, stabilize it. This is a nice feature, although I have heard that the serrations can rip your palms if you let the tool rotate through your hand at the end of your swing. I don’t swing that way and didn’t have the problem. If you do, give the serrations a few licks with a file to smooth them.About an inch above the pommel you find a neat little hold. 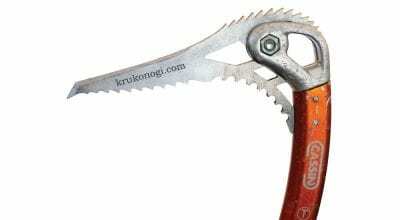 Obstensively, this is for clipping to use the tool as an anchor or resting on in a pinch, but few carabiners are small enough to fit. If you want to use the hole you’ll need to thread a bit of perlon through it, and clip to this. Not ideal. The Ergo is one of the best—maybe the best—dry tools I have used and, pleasant surprise, it was also a precise weapon on ice. The secondary grip is straight and wrapped with rubberized tape. The tape ripped to pieces on me after a few outings, but this is minor since you need to wrap the entire shaft with double-sided friction tape ($2/roll at any hardware, and the single best improvement you can make to any tool), making it much easier to hold and less likely to slip off when you have the tool shoulder holstered. Pick shift on the secondary grip is minimal, but there is a bit of movement when the tool is freehanging. The Ergo grip orientation and shaft bend places you hand in a semi chin-up bar orientation that is advantageous for super steep tooling, as it puts your hand in its most powerful position. To see why this is so, hang one-handed from a chin-up bar. Then, hang one handed from a bit of broom handle that is hanging vertically. It’s easier, much easier, to hang from the chin-up bar. 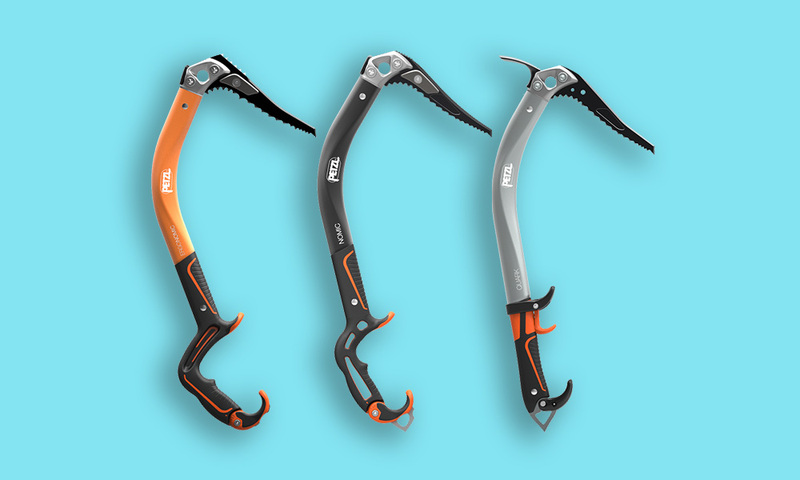 Almost all techy mixed tools (Petzl Nomic, Black Diamond Fusion) have a similar grip orientation, and mid-grip pinky rests, but the Ergo takes it a bit further. The Ergo also has a third grip rest about half way up the shaft. This grip is adjustable, so you can set it where you want. I kept it about a hand width above the secondary grip, the most useful spot for walking your hands up the tool, and within easy reach to use for switching hands on either of the lower grips. I had thought that the high grip rest would interfere with tool clearance, but because the Ergo’s shaft bend is so extreme, giving the tool the clearance of a jacked-up monster truck, I never had a problem. You do need to note that holding onto the high grip can cause the shaft to shift, blowing the pick off the hold. On ice you’ll might never need the highest grip and you can remove it if it becomes a bother. I had heard that the Ergo was a steep terrain or “cave” tool, and that it wasn’t good for ice slabs, but, actually, slabby ice is more likely to have bulges and blogs that you need to reach over than steep ice or overhanging rock, and, again a surprise, the Ergo is great on the low angle stuff. Great, that is, if it suits your swing. Ice tools, like rock shoes, require the right fit. I used the Ergo with the Dry pick ($59.95). 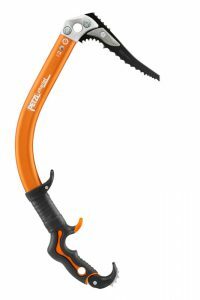 This climbs well on ice and rock straight of the box, but it performs even better when you file off the first two milk teeth, which can lever the tip of the pick off the hold or block it from stabbing into small pockets. My big gripe with this pick isn’t limited to this design, rather it applies to every single pick out there: At $60 each (BD charges $48), picks are too blasted expensive. Manufacturers either need to drop the price by half, or make a pick that will last. When you sharpen your picks every weekend, and touch them up after each burn like you should, a set of picks will last one month at the most. $120/month for picks is crippling. If pick prices are going to stay high, and they will, I’d like to see a pick design than can hold up to wear and sharpening. This could be as simple as making the pick a half inch longer (yeah, yeah, it would change the pick-to-grip relationship, but only slightly and this changes with all current picks anyway due to sharpening/shortening) or get rid of all the milk teeth and make the entire front of the pick one big tooth that can take twice as many sharpenings. I did not test the Ergo with the Ice pick ($54.95) or the add-on hammer head ($47.95). With the Dry pick and without the bolt-on two-ounce head weights, the Ergo weighs 1 pound 7 ounces, two ounces heavier than the Nomic and one ounce heaveier than the Fusion. With the adjustable third rest removed, the Ergo would weigh about the same. In hand, the aluminum headed Ergo feels light because much of the weight is in the shaft. I like a light, and light-feeling, tool. I used to prefer a heavy tool, thinking it penetrated hard ice with less effort, but as I have gotten older and weaker I’ve decided that a lighter tool is overall less tiring. Who needs the Ergo? You have to be a serious mixed climber to shell out $680 for a pair of these hummers, but then again this is a serious tool. If you are currently using a more-standard tool, the Ergo will be a decisive step up in performance for you, and you can probably bump up a number grade or two right away. If, on the other hand, you already use the Nomic or Fusion or other similar tool, you will probably find that the Ergo is just a little, nuanced bit better and it probably won’t make an M12 climber into an M13 climber, it’ll just make you more solid at whatever grade you are currently sending. The Ergo has a hard to clip hole, but the three grip stack is the best of any tool. Friction tape was added to improve grip. I gave the Ergo five stars, the highest possible, because this is the best technical tool I have used, and I’ve used every one that is available in the U.S. After several years of use with this tool, I still haven’t found anything wrong with it. I still wish the picks were less expensive; I go through several sets a season. • Radical bent shaft yields most clearance of any tool. • Ergonomic grip is easy to hold and comfortable. • Shaft orientation puts your hand in its most powerful position. • All aluminum head gives tool a light feel. • Adjustable third grip simplifies switching hands on same tool or walking up for a higher reach. • Adjustable main grip makes tool one-size-fits all.